Parents dread the 4-month mark. Why? That’s when your once-sleeping baby turns into a hungry, grumpy, sleep-avoiding monster! Experts call it sleep regression, also known as sleep-deprived-mom torture. While this is torturous for parents, it’s the result of a growing and changing child skill set. Knowing when sleep regression strikes can help you fight it. Here is the full scoop on sleep regression and sleep regression ages. We cover how to spot sleep regression at different ages, how to handle sleep regression, and answer all of your questions in one handy-dandy article. How long does baby sleep regression last? How will I know if my baby is experiencing sleep regression, a growth spurt, teething, or illness? When should I call a doctor about sleep regression? Can I prevent sleep regression? Your baby has been awake two hours past her normal bedtime. Two hours! That’s two loads of laundry, a plate of food, loading the dishwasher, and going to the bathroom without a baby in a bouncy seat in front of you. You want those two hours the baby stole from you. Dramatic right? Overtired moms who spend all day caring for the needs of others get a little desperate for some time to care for their own needs. So, why is your baby punishing you by sleeping less? Is the baby doing this on purpose to take away your last shred of energy? Trust me, your baby is not trying to take away your precious alone time or cause you to lose sleep. Your little one is growing and with growth comes new sleep patterns. As babies grow, their sleeping patterns change often too. A baby who usually sleeps through the night might wake frequently during the night or refuse to take a nap. And here you were all excited to have the dream baby who slept through the night at four weeks old, only for the baby to wake you up every two hours at four months! Sleep regression is inaccurately named as babies who change sleep habits are not regressing from good sleep habits to bad sleep habits, but instead transitioning to new sleep habits with natural growth. A transition can take two to six weeks to settle back into a routine. In the meantime, you and baby are probably irritable during the shift. Not only is your little one sleeping less at night, but taking shorter naps. This translates to fewer chores done, less sleep for mom, less time to take care of personal hygiene, less time to take care of siblings, and just have a few minutes caring for the needs of the house and yourself. If your infant is experiencing any of these systems, chances are they are in a sleep regression. Lucky you! The first year of a baby’s life is also the year of the most growth for babies. Each age comes with its own stages and reasons for shifts in sleep patterns. Sleep regression can happen at different ages for each baby but tend to happen at or around 4 months, 6 months, 8 months, 12 months, 18 months, and age 2. Not every baby will experience each of these regressions. Your baby might only have a 4-month regression and a 12-month regression, or only one regression, or all of the regression. Let’s look at each age and how to handle the change in sleep patterns based on age. Congratulations, at the four-month mark your little bundle of joy is no longer a newborn! Newborns fill their days with eating, sleeping, pooping, peeing, and crying. That’s it. Now, because your baby is older she can do more. She can look at the world around her and explore. At this age, she has realized she controls her little body, including her arms and legs. Some babies begin rolling over at this age, others rolled over for the first time months ago but now are learning to control their ability. Either way, life was one dimensional for your newborn, now that your baby is older a new dimension has heightened her senses and she naturally wants to examine everything! Your baby will stay awake longer now between naps to investigate their world. As a newborn your little girl was asleep more than she was awake, now you can expect her to be awake for more hours in a day as she only needs 12 to 15 hours of sleep. Babies at four months old want to explore movement, now is the time to let your baby play. With all their curiosity about moving their little bodies and discovering their hands and feet, give them time and opportunity to explore, that means more belly time. Do you have a playmat yet? Now is the time to give your baby more opportunities to explore the world around them. 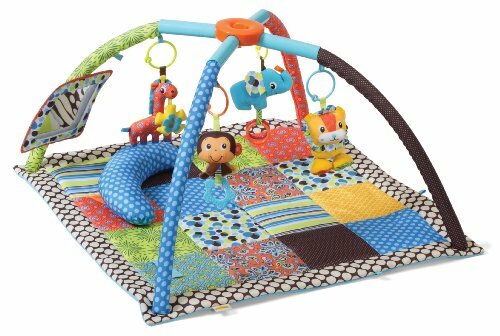 A playmat or play-gym gives your baby the opportunity to play and explore their new world and their adorable little hands and chubby little feet. Give her time to play will tire her out so she will be ready for a nap and bedtime. Plan playtime for about thirty minutes to an hour from when you would like your baby to go to bed. Put baby to bed drowsy but still awake. Do not be afraid of a little fussing or crying. They know crying gets attention, and it’s their only way of communicating as they cannot talk yet. Tell your baby you are putting her to bed. Babies may not understand what you are saying but eventually, they will understand. Just like everyone else, babies want to know what is happening and why. 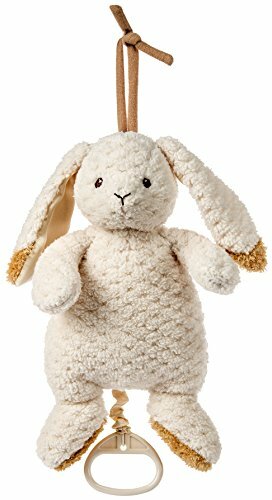 Give baby a way to self-soothe like a musical stuffed animal with a pull string. At four months your little one cannot pull the string themselves but in a few months, she will be able to pull. Start now while she is little and she will find comfort in the item now and in the future when she can activate the music on her own. Keep a routine. After playtime, feed your infant, change her diaper, put her in pajamas, or a sleep blanket, then put her to bed. Consider no lights for the babies room. Many parents believe their babies will be afraid of the dark but this is not always true, they become used to lights as parents assume they are necessary. Babies do not enter heavier sleep with lights on, allow your baby full sleep by turning the lights off. Feed on demand. Growing babies expend more energy and need more food for growth and expenditure. Like exercise for adults, the more active a baby is the more appetite she will have. Babies may no longer fall asleep as easily from motion such as a baby swing, driving int he car, or being rocked. As your baby gets older, her sleep will become more adult-like and sleeping with motion will prevent her from entering REM sleep. Allow the baby to fall asleep on their own for a deeper sleep. Your baby will be less fussy when she is not overtired. Babies at four-months are rolling over with some degree of control, swaddling them may no longer be safe. Switching to a sleep blanket is a safer option. This sleep regression is a permanent change. Your baby will no longer sleep like a newborn because she is no longer a newborn. Napping will change. Plan for shorter naps less frequently. Try to be consistent with napping. If your baby sleeps eight hours at night plan for two to three three hour naps. Be willing to follow your babies natural habits. At six months, your baby boy will learn more new skills. Some babies are learning to move on all fours, or even crawling, others are working on rolling over or grasping objects. Either way, your little guy is busy learning, that’s his job, to learn, and he needs time to investigate and hone his new skills. The world fascinates babies and increases their desire for new changes in skill level to help them focus on learning to control their bodies. Yeah for your baby! He is working hard and focusing like a champ! His newfound focus may prevent him from wanting to sleep. A fuller belly from solid foods. Food habits change sleep habits because they have a different full sensation and stay full longer with solid food. Food may no longer be a cue for your son to fall asleep. Motion becomes even less of a sleep-inducer. You may find your baby staring at the world around him from your rear-view mirror. Object permanence – your baby can now recognize when an object – like mommy – is no longer in the room. This change is a frightening change for your baby as he learns more about being alone in his own space. Cutting teeth – many six-month-olds are beginning the teething stage and drooling. The pain from teething can keep them awake. Coupled with the other stimulants, your baby may reject sleep. Let your older infant have plenty of time to practice new skills. More tummy time and time on the floor. Surround your baby with stimulating toys to help him tire out. Feed your baby close to bedtime. Some babies still allow a full belly to soothe them to sleep. Keep a consistent routine as much as possible. Expect shorter naps. Your baby may still need three to four naps but they will be shorter or they may drop one of their daily naps all together. Less napping in the daytime allows them to sleep longer at night. 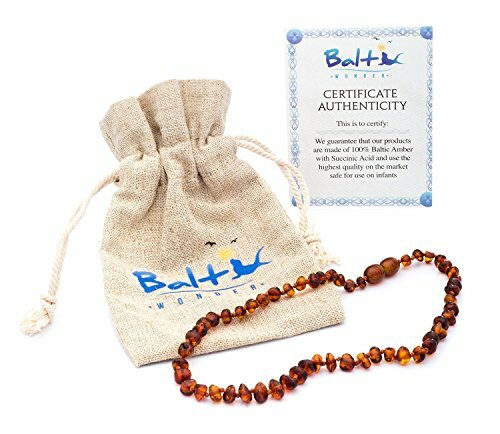 Consider an amber teething necklace for teething discomfort. Less discomfort means more sleep! At eight-months-old to a year old, your little one will experience more developmental milestones, which translates to more reasons to sleep less. Many babies are crawling, sitting, walking around furniture, or learning to walk! Big steps in baby land. If that were not enough, your little gal is learning to speak, and she does not want sleep to stop her from practicing saying mama or dada (why do they always say dada first when we did all the hard work?!). Add this all to a few new teeth glistening in her mini mouth and you have a recipe for a baby who wants to spend more hours awake and less time wasted sleeping (their opinion not ours. If they don’t want their nap can I have it?). Expect your baby to drop a nap. They have an entire world to explore! Well, at least your house and they want to make messes! Separation anxiety is strong in almost-toddlers, anticipate some extra clingy behavior. Anticipate your little one waking up more in the night. Babies want to play with blocks not be stuck in a crib! They do not want to take this stage lying down! Try to get baby to sleep for two naps as they still need that extra sleep despite not wanting the nap. Continue to be consistent in their routine. Continue letting your little one self-soothe to sleep. Make sure your baby knows that even if you are not in the room, you are nearby. Separation anxiety may keep baby awake because they miss you even though you are just in the living room catching up on the new Grey’s Anatomy episode. The 18-month sleep regression is a considerable regression. Your little guy is probably down to a single nap now and they fight with every bit of their marginal strength to avoid napping! Why? Because this is the age for a new milestone: independence. Yep, your boy has opinions and expects then to be listened to! Separation anxiety is stronger when your boy turns one-and-a-half-years-old. Babies are also growing molars around this age, so keep the teething necklace nearby. Anticipate your little guy fighting naps or only napping once a day. Your baby only needs about 12-14 hours of sleep now and trust me, they do not want a minute longer away from exploration. Expect teething. New molars mean new pain. Your baby will fight going to bed at night. Your child will wake less in the night but will be very insistent to be out of bed as soon as they wake up. Limit screen time. The more your baby watches TV, the less he is playing and wearing himself out. Do not give in to whining. Give lots of affection at night. Read a book, sing a song to help fight separation anxiety. By two your child spends more time awake than sleeping. She will still need 12-14 hours of sleep but gets most of her sleep at night with just a short nap in the day to recharge her battery. Big transitions are still happening: potty training, possibly a new sibling, and a big kid bed. This is also the age where many children experience their first nightmare. All of these changes lead to your baby wanting to fight sleep. As with the other stages, the most important way to handle a sleep regression is with a steady routine. Continue to keep a bedtime routine such as reading a book and singing a song to fight separation anxiety. For the most part, this will be the last real sleep regression and your child will continue to sleep well until they are a teenager. Let’s burn that bridge when we get there. Most times sleep regressions or transitions last 2 to 6 weeks but can be longer or shorter depending on your child. Teething babies mimic sleep regression but also comes with a whole lot of baby drool and biting to assuage their pain and also tend to eat less because of mouth pain whereas sleep regression usually means a baby will eat more. Growth spurts also mimic sleep regression but only last a day or two while a sleep regression will last for two to six weeks. If your baby is unsoothable or has other concerning symptoms your baby may need to see the pediatrician. A fever, runny nose, rash, tugging on her ears, or other symptoms of pain indicate a virus or infection and not sleep regression. If your baby shows signs of struggling to breathe contact your doctor immediately. No. Some babies naturally shift into new sleep patterns or just tire faster than other babies, but sleep transitions are a necessary part of growth to accommodate babies changing needs. Follow the tips above to work through a transition more easily and always be sure to follow good sleeping habits. Moms may find keeping up with babies sleep changes difficult, especially when moms know what they want: sleep! The goal of surviving sleep regression is to stay flexible but consistent. As with all other baby stages, sleep regression will pass and your baby will find a natural rhythm for sleep. Good luck and try to sleep when you can! Similac Sensitive vs. Enfamil Gentlease–Which Is Best for my Baby? Diono Rainier Car Seat Review – Buy or Bye?